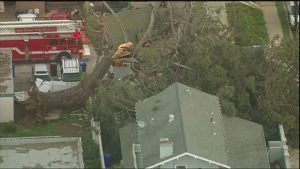 SAN DIEGO, Calif. (KNSD/NBC) – Two people were killed when a tree crushed a home in San Diego Monday morning. The tree, which was estimated to be about 100 feet tall, fell on the home in the Point Loma Heights neighborhood of San Diego. Two people were believed to be sleeping in a bed on the upper floor when the tree came down around 6:15 Monday morning. The massive tree caused significant damage to the structure of the home and was hindering crews from reaching the people inside. The tree collapsed during a high wind warning for the area.